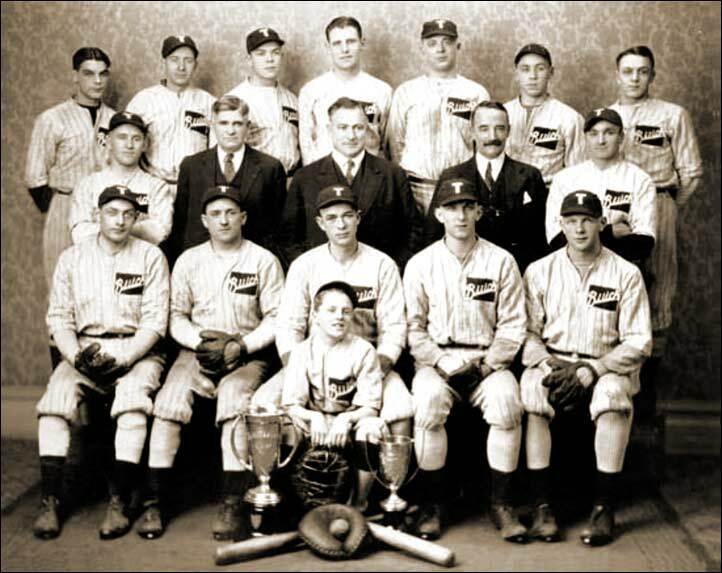 T.J. Trapp Buicks Baseball Team, New Westminster Senior "B" Champions - 1927. Winners of Homer E. Leash Cup and Blakeley-Trapp Cup. Shown in the back row from left to right are Walter "Hop" Wilkie (Short stop), Jas A. Blair (Right field), Wally Mayers (Left field), M. Shiles (Pitcher), R. Butler (Third base), Doug Grimston (First base), Len Stoddart (Catcher). Shown in the second row from left to right are: H. Butler (Second base), H. Gray (manager), T.D. Trapp (President), R.H. Moffatt (Sec. Treas. ), Haddie Stoddart (Pitcher). Shown seated from left to right are: Gordon Currie (Pitcher), F.F. Ennus (Right Field), D. Finlayson (Captain), Francis Ennis (Mascot), E. Paulson (First base), and I. MacDonald (Centre Field).